Lin-Manuel Miranda, composer and creator of the award-winning Broadway musical, "Hamilton," proudly waves a Puerto Rican flag after receiving a standing ovation at the premiere in San Juan, Puerto Rico, Jan. 11, 2019. Lin-Manuel Miranda reprised his lead role in the hit musical “Hamilton” Friday night to start a two-week run in Puerto Rico expected to raise thousands of dollars for artists and cultural groups struggling in the wake of Hurricane Maria. “I have never felt anything like that,” he said of the crowd’s energy, adding that singing the song “Hurricane” was a challenge. “It was very hard to sing that here in Puerto Rico because you know better than I what it is to survive a hurricane. I feel like I’m going back to Maria a little bit every time I sing it,” he said. Actors of the the award-winning Broadway musical, "Hamilton," including its composer and creator Lin-Manuel Miranda, center, receive a standing ovation at the premiere in San Juan, Puerto Rico, Jan. 11, 2019. After the two-hour show, Miranda spoke with reporters, who peppered him with questions about how the White House was exploring diverting money for border wall construction from a range of accounts, including using some of the $13.9 billion allocated to the Army Corps of Engineers after last year’s deadly hurricanes and floods. 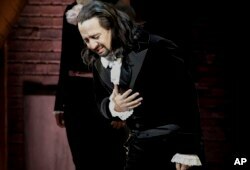 Lin-Manuel Miranda, composer and creator of the award-winning Broadway musical, "Hamilton," receives a standing ovation with tears at the end of the play's premiere in San Juan, Puerto Rico, Jan. 11, 2019. Alvira, like several other Puerto Ricans who attended opening night, snapped up her ticket thanks to a lottery launched by “Hamilton” organizers who are selling 275 tickets for every performance at $10 each. Among those expected to attend the show in upcoming days are several federal lawmakers visiting the U.S. territory for the weekend to learn more about reconstruction efforts following Hurricane Maria, which caused more than $100 billion in damage when it hit Sept. 20, 2017. The change forced some people on the U.S. mainland to forgo their Hamilton tickets because they were unable or could not afford to change their airline tickets to accommodate the show’s new dates. Others were upset when they did not hear back from the agency responsible for reassigning new dates for previously purchased tickets. 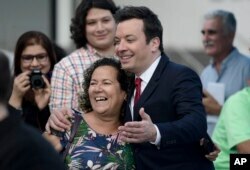 Jimmy Fallon greets people in the entrance plaza of the Santurce Fine Arts Center moments before the premiere of the award-winning Broadway musical, "Hamilton," starring its creator, New York native of Puerto Rican descent Lin-Manuel Miranda, in San Juan, Puerto Rico, Jan. 11, 2019.